Identicator LE10 LE-10 Inkless Fingerprint System FREE SHIPPING! This system doesn't require any special paper and can be used with the standard issued fingerprint card. Prints are acceptable to the FBI for classification, search, and retention. Includes LE-110 Replacement Kit (finger pad and developer sheet). 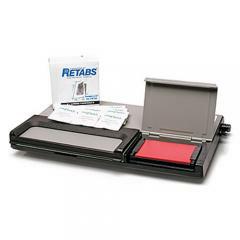 Capacity: Develops 500 ten-print cards per pad/replacement kit. ©2002-2019 CopsPlus.com: Identicator LE10 LE-10 Inkless Fingerprint System FREE SHIPPING!